Meet three of our own local growers and be inspired to put local produce on your festival table (&all year round). If you ask Darren from New Life Farm why eating local matters, he’ll tell you that it’s a little bit like an onion. Peel back the golden skin and you’ll find layer upon layer and reason upon reason why local food is good for you, your community and the earth. Eating local is about more than reducing food miles and supporting the local economy (although those things are pretty great). It’s a way to reconnect, to come back to the root of things. Food, after all, doesn’t begin as a product in the supermarket. It begins as seed, or as sprout. It is grown in relationship with the earth. Anyone with soil underneath their fingernails will tell you that growing food is a dance that requires humility; one that asks us to look towards the sky and to the soil, one that encompasses all the wild and wonderful biodiversity of our region. When we eat local, we become part of this relationship. It’s a way to give, as well as take. To nourish, as well as be nourished. In the lead up to Christmas we thought we’d celebrate local food by asking a few local growers about why they do what they do, and what they’re keen to get on your plate this festive season. New Life Farm – Sapphire Beach. New Life Farm is a run by a guy called Darren. 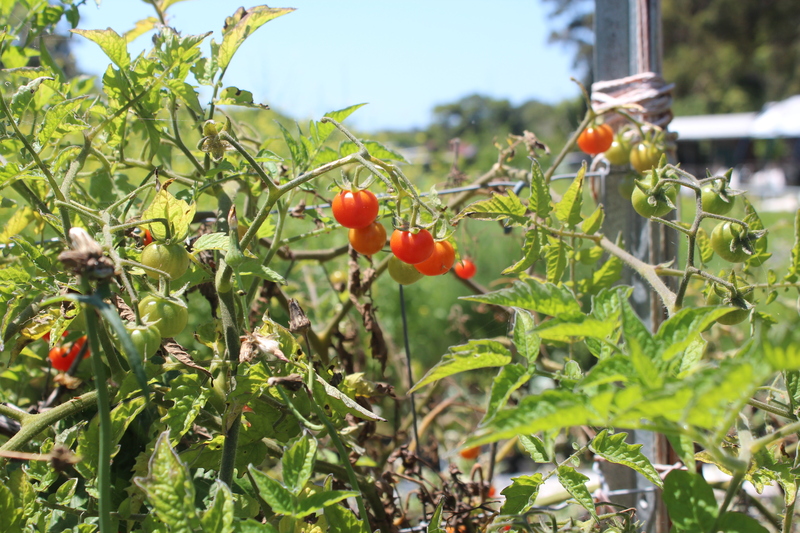 Inspired by the principles of permaculture and holistic management, all the produce on the farm is chemical free and grown in a way that enriches the soil and supports biodiversity. Over the last three years, Darren’s been supported by a bunch of locals that love his produce. For his customers, it’s a love that goes beyond appearances. “I often see posts on social media about the food waste that’s coming off the back of cosmetic standards. At New Life Farm we supply five local cafes and do about forty veggie boxes a week. As long as it’s healthy, it goes in a box no matter what it looks like! So far no one’s been worried about it. Everyone’s just happy that it’s super fresh and tasty”. Whether it is advice, a cutting of a herb or a few sundried bananas, Darren’s the kind of guy who will never let you go home empty handed. What he’d like most is to be the farmer that he never knew while he was growing up. The one that lives just down the road; the kind that’s there to show us where our food really comes from. Wayne and Susie have been farming for just over a decade, and in that time have come to fill quite a niche in the Coffs Coast local food scene. Susie was born in Chiang Rai, Thailand and it was there that she learnt how to farm, forage and identify edible and medicinal plants. A lot of the business, Wayne says, is based on her knowledge. Alongside Wayne’s citrus orchard and garlic patch are Susie’s gardens, teeming with a diversity of veggies and Asian greens. A lot of what they grow isn’t part of the typical Aussie diet (Wayne affectionately refers to the more exotic greens as ‘weeds’), but for the most part, the unfamiliarity of their produce hasn’t been a problem. For Wayne, encouraging people to try new things is one of the most rewarding aspects of being a grower, and Susie is central to this. She teaches people how to cook with veggies they’ve never seen before, and has people coming in especially for her medicinal plants. “We’re living in a multi-cultural society and there’s so much to learn from each other. Food is a part of that”. Synchronicity Farm is run by Josh and Tomko Allen. It’s a social enterprise with many branches, but it’s roots have always been in providing the community with organic food grown in living soil. Synchronicity farm is part of a growing global movement called Community Supported Agriculture (CSA). CSA is essentially a way of shaking the hand that feeds you. By joining the farm as a member, you receive an organic food box every week. This Christmas, Josh and Tomoko will be filling these boxes with herbs, leafy greens, capsicums, chilli, rhubarb, zucchini, garlic, watermelon and plenty more. What’s even cooler is that they upload their planned harvest to their website (www.rawfoodhub.com) every week so that their customers know exactly what’s growing! One of the many things that Josh and Tomoko are passionate about is fermented produce, something they enjoy not only at Christmas, but all year round. “With organic cabbage, capsicum, herbs, cucumbers, beetroot, chilli, ginger, garlic and other produce that preserves well, we use all sorts of natural techniques to do sauerkrauts, kim chi, chilli sauces, pickles, drinks and more. Apart from tasting amazing, they bring more diversity to the table by adding probiotics and naturally occurring enzymes into our diet”. The best place to meet your local growers is at the farmer’s market. The Coffs Growers Market is on every Thursday in Coffs Central, and on Sundays there’s the Coffs Harbour Uptown Markets and the Jetty Market. To make it that much easier, the team at Our Living Coast have out together a monthly market calendar. Head to: www.ourlivingcoast.com.au/events/local-markets/.